One of my favorite movies is Dusan Makavejev's Montenegro. Montenegro is a slightly soft-core pastiche of Ingmar Bergman films. It is Susan Anspach's best work. Many people, including Vincent Canby, felt it might just make her a star. As far as I know, Montenegro was her last film. The Cliff Notes version: Bored housewife (Anspach) with lovely kids, a Swedish husband and a big house meets Yugoslavian immigrants at the airport and becomes drawn to their gypsy life. In 1981, the movie was the first "comedy" screened at Cannes. I wouldn't say it was a comedy, in fact at times it is rather sad. Still, I have always loved the film. It ends with Marianne Faithful's haunting rendition of The Ballad of Lucy Jordan. The Ballad of Lucy Jordan was written by Shel Silverstein. Shel Silverstein wrote quite a few memorable songs and they have recently been compiled into a tribute album, Twistable Turnable Man. 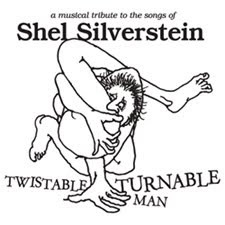 Twistable Turnable Man features Lucinda Williams covering The Ballad of Lucy Jordan. I have been listening to the CD, endlessly. I think The Ballad of Lucy Jordan was never covered because Marianne Faithful's version is just so poignant. Lucinda Williams gives it her best shot, but hear-to-head, I thing Marianne wins. That being said, I love the CD. Both Twistable Turnable Man and Montenegro are available on Amazon. Montenegro, alas, is not available on Netflix, so you will have to score a nice used copy or you can come to Shirley and we will watch it together. the first artists who officially released the Lucy Jordan song were Dr. Hook (1975 or '76). At that time and years before Shel Silverstein wrote most of the songs Dr. Hook & the Medicine Show were performing. Marianne Faithful heard the song on the radio and she liked it so much that she recorded it also. So the story goes... I like the version of Marianne F. very much, nevertheless I prefer the first version of Dr. Hook a little bit more.